Maine State House file photo. 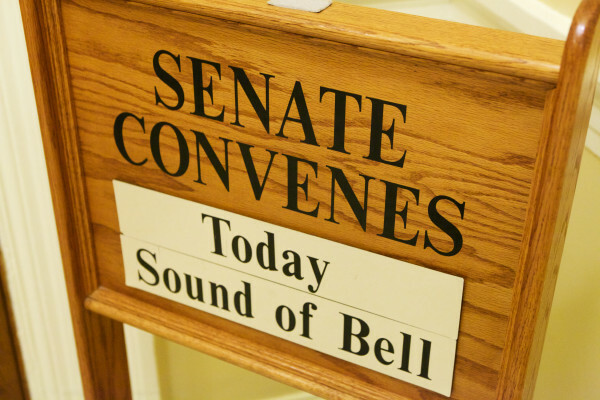 AUGUSTA, Maine — The Maine Senate took 47 minutes Friday to vote 128 times to override 64 vetoes of biennial budget line items Gov. Paul LePage issued Thursday with the stated intent of obstructing the legislative process. The House and Senate also overrode more than a dozen line-item vetoes of the Highway Fund budget Friday. The Senate votes on the biennial budget line-item vetoes made the overrides official, after Thursday night’s equally breakneck override voting spree in the House. In both chambers, where legislative leaders used a parliamentary procedure called “division” instead of roll-call votes to expedite the process, each vote took less than 30 seconds to complete. Democrats and Republicans aligned to create overwhelming majorities voting to override the vetoes that targeted specific spending proposals in the budget. A loud standing ovation erupted early Friday afternoon in the Senate when Senate Majority Leader Garrett Mason, R-Lisbon, who was at the rostrum for the second half of the override votes, banged the gavel after the chamber’s final override vote on the biennial budget. LePage issued line-item vetoes of the biennial state budget Wednesday, hours after it was enacted in the House and Senate. On Thursday morning, he released a copy of the budget with his line-item vetoes written on the document. That move triggered a flurry of activity among legislative staff, who scurried to prepare documents that could be used for the veto votes Thursday and Friday in each chamber. Unlike bill vetoes, which require two-thirds majorities in the House and Senate for overrides, line-item vetoes require a simple majority in each chamber. The end result of the line-item veto voting spree is that a compromise $6.7 billion two-year budget remains in the form it took after House and Senate approval votes Tuesday and early Wednesday morning. The line-item vetoes reflect the latest escalation in acrimony between the governor and Legislature. LePage has grown increasingly frustrated with lawmakers’ refusal to adopt key elements of a sweeping tax reform package he introduced in January as part of his budget proposal. LePage is expected to veto the biennial state budget, which by law he must do by day’s end June 29. Friday’s House and Senate overrides of line-item vetoes in the transportation budget — a separate document from the biennial operating budget — means $1 billion spending plan also remains intact from when it first gained legislative approval. LePage had not indicated whether he would veto the Highway Fund budget, but he recently vowed to veto all legislation presented to him to force any new law to receive two-thirds support in both chambers. Adhering to that promise, the governor issued 21 new vetoes late Friday afternoon. The biennial budget must be in place by July 1 to ensure continued funding for state government operations.